As part of our holistic approach to farm management, we have incorporated the use of Alpacas. Alpacas are camelids and are beautiful grass eating animals with gentle temperaments. 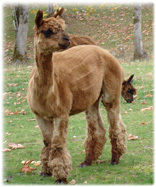 Alpacas are social herd animals with silky, lustrous fibre. Alpaca fibre is renowned for its softness, anti-allergenic properties, and its warmth. People who are allergic to wool find this fibre to be the perfect alternative to keep them warm. It can be spun and made into any product that is traditionally reserved for wool. Alpaca fibre is sheared off once-a-year to help cool the Alpacas during the summer months. If you enjoy spinning, order some of our raw Alpaca fibre from our product order page. Alpacas are the perfect companion to our 100% pasture ranged chickens, as their docile temperament is not disrupted unless evidence of a predator is present. The Alpaca's protective instinct help keep our chickens free from predatory animals like coyotes, and allow the chickens the freedom they enjoy from our mobile pasture coops, (learn more here). Learn more about our holistic approach to farm management here.